Since 1985, Order of Omega has awarded over $1.2 million in undergraduate scholarships and more than $200,000 in graduate fellowships. Questions may be directed via email to Reatha Cox (Vice President of Order of Omega). The Order of Omega sponsors undergraduate Scholarship Awards in the amounts of $100 – $2,000 annually. Scholarship applicants must be initiated members registered with the Order of Omega Headquarters. Chapters in good standing with the Order of Omega Headquarters shall determine the process for nominating or selecting the members to apply for the awards. • Three (3) applicants for any chapter initiating their full complement of new members during the previous academic year. • Three (3) applicants for chapter initiating over 75 members during the previous academic year. CLICK HERE for a list of chapters eligible to submit three applications. Successful applicants should display leadership and service to their Order of Omega chapter, fraternity and sorority community, and campus community. The Parker F. Enright Scholarship ($750) was established to honor Order of Omega’s founding advisor. Enright, the fraternity advisor at the University of Miami, served as the Executive Director from 1959 – 1964. The Patrick W. Halloran Scholarship ($500) was established to honor Dean Patrick W. Halloran. Dean Halloran, assumed the role of advisor following Mr. Enright’s departure from the University of Miami and served Order of Omega from 1964 – 1971. The Kent L. Gardner Scholarship ($300) was established in 1999 to recognize Dr. Kent L. Gardner, former Vice President of Student Affairs at the University of Texas at Arlington and Order of Omega’s Executive Director from 1971 – 2013. Dr. Gardner’s service to the Order of Omega spans more than 45 years and he currently serves as the Executive Director Emeritus. During his tenure as Executive Director, the Order of Omega Scholarship and Fellowship program was established and has grown from $5,000 awarded in 1985 to over $80,000 awarded annually to outstanding undergraduate Greek leaders, graduate students, and professionals pursuing doctoral degrees. The Founders Award Scholarship ($1,000) was established in 2009 to celebrate the Order of Omega’s milestone of awarding $1 Million in undergraduate scholarships. 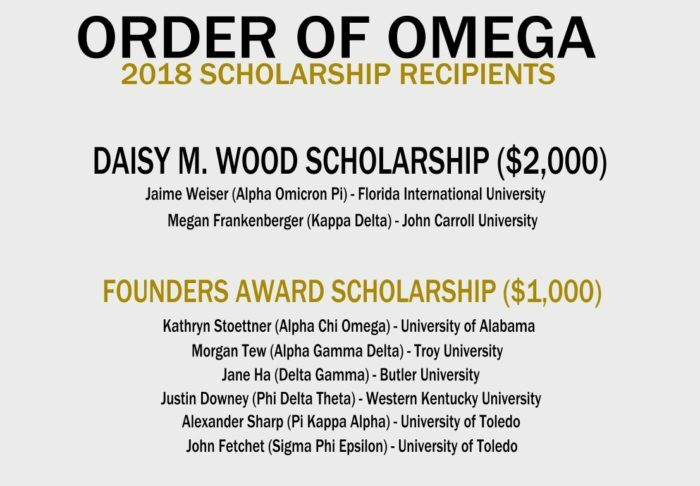 The Daisy Wood Scholarship ($2,000) was established in 2014 to honor a long time Order of Omega Board Member, Daisy Wood. A former President of the National Pan-Hellenic Council, Daisy Wood served the Order of Omega from 1994 – 2014. The Daisy Wood Scholarship is valued at $2,000 and is awarded to the top scholarship recipient. The Order of Omega Scholarship ($100) was established in 2015 and in continued support for leadership, service and scholarship. APPLICATION PERIOD IS OVER FOR 2018. REMINDER: Scholarship application materials – letters of recommendation, unofficial transcript, and photograph should be emailed to scholarship@orderofomega.org to complete the application process! 2018 Undergraduate Scholarships have been awarded. Q: My Order of Omega Chapter is not very active, but I want to apply for the Order of Omega Scholarship. Does my application need to go through the Order of Omega Advisor, or can I just submit it directly to the Order of Omega Headquarters? A: Order of Omega Scholarship applications require the Order of Omega Advisor approval. Please contact the advisor’s supervisor if you are having an issue contacting the advisor. Q: My Order of Omega Chapter is not currently in good standing with the Order of Omega Headquarters, but I want to apply for the Order of Omega Scholarship. What can I do? A: The privilege of applying for the Order of Omega Scholarship Awards is reserved for chapters in good standing with the Order of Omega Headquarters. Please contact the Order of Omega Headquarters or your Regional Chapter Director (found on the website) and let us assist you in reestablishing the chapter or fulfilling the requirements to achieve good standing status. All requirements must be fulfilled before the chapter is eligible to submit scholarship applications. Q: Can my fraternity/sorority Chapter Advisor approve my scholarship submission instead of the campus Fraternity/Sorority Advisor? A: The Order of Omega Advisor must approve the scholarship submission. Chapter Advisors, House Corporation Presidents, or other local chapter advisors cannot fulfill this requirement. Q: Can the official transcript(s) be delivered via email directly from the University? A: Yes, as long as it is through a secure link or an email directly from the Registrar. Q: Are newly initiated members eligible to apply for Order of Omega Scholarship Awards? A: All members in good standing are eligible to apply for the Order of Omega Scholarship Awards. Although newly initiated members may be eligible, consideration should be given to those members with the potential to meet the criteria of leadership and service to the Order of Omega, Fraternity/Sorority community, and the campus community. Each chapter should establish scholarship guidelines to facilitate the scholarship application process. Q: Does the scholarship apply towards tuition only or can it also be applied towards room/board, books, fees, etc.? A: The scholarship funds are to defray college expenses. All scholarship disbursements are sent directly to the student. The Order of Omega sponsors two Graduate Fellowship Awards in the amounts of $1,000 and $2,000. The Order of Omega Doctoral Fellowship Award is $2,000 and the William J. Brennan and Jacque Placette Chapman Master’s Fellowships is named in honor of two of the founding members of the board of directors and is in the amount of $1,000. Applicant must be currently enrolled full-time or part-time in an accredited master’s degree program in Higher Education, Student Affairs, or a related field. Applicant must be currently employed part-time or a graduate assistant with direct or indirect responsibility for advising Fraternity/Sorority Life and/or the Order of Omega chapter. Applicant must be currently employed and enrolled at a college/university with an Order of Omega chapter that is in good standing with the Order of Omega Headquarters. Applicant must be currently enrolled full or part-time in an accredited doctoral degree program in Higher Education, Student Affairs, or a related field. Applicant must be currently employed full-time or part-time, or a graduate assistant with current direct and/or previous direct responsibilities for advising Fraternity/Sorority Life and/or the Order of Omega chapter. Applicant must be currently employed and enrolled at a college/university or previously employed at a college/university with an Order of Omega chapter in good standing with the Order of Omega Headquarters. DEADLINE: Applications and supporting documents are due Friday, November 2, 2018 by 5 p.m. CST. Fellowship Award recipients will be announced at the Order of Omega Recognition Reception in conjunction with the 2018 AFA Annual Meeting in Indianapolis, IN (December 2018). Q: I am not a member of the Order of Omega. Am I eligible to apply for the Fellowship awards? A: Membership is not required, but is certainly encouraged. Order of Omega Fellowships are awarded to graduate students who demonstrate a commitment to the fraternity/sorority community and the Order of Omega. We encourage you to work with the chapter leaders to explore opportunities for honorary membership or participate in an honorary initiation at one of the regional conferences. Q: Is there a limited number of applicants from each college/university? A: Order of Omega Fellowships are awarded to graduate students who demonstrate a commitment to the fraternity/sorority community and the Order of Omega. There can be multiple applicants from accredited master’s degree programs. Q: I was an undergraduate member of the Order of Omega; however, my master’s degree program is in another field. Am I eligible to apply for the Order of Omega Fellowship award? A: Order of Omega Fellowships are awarded to graduate students who are enrolled in an accredited master’s degree program in Higher Education, Student Affairs, or a related field. Q: I have previously been awarded an Order of Omega Scholarship and/or am Order of Omega Fellowship. Am I eligible to apply again? A: Yes, as long as you still meet the award criteria, you are eligible to apply for the Order of Omega Master’s Fellowship or Doctoral Fellowship awards. Q: The Order of Omega Chapter on campus is not very active, but I want to apply for the Order of Omega Fellowship. Am I eligible to apply? A: Order of Omega Fellowships are awarded to graduate students who demonstrate a commitment to the fraternity/sorority community and the Order of Omega. Although you would be considered eligible, we encourage you to utilize the Order of Omega Headquarters and the Regional Chapter Directors for ideas to grow the chapter. Q: My campus does not have an Order of Omega Chapter. Am I eligible to apply? A: Master’s Fellowship Applicants must be currently employed and enrolled at a college/university with an Order of Omega chapter that is in good standing with the Order of Omega Headquarters. Please contact the Order of Omega Headquarters or your Regional Chapter Director (found on the website) and let us assist you in establishing a new chapter or fulfilling the requirements to achieve good standing status for the chapter. All requirements must be fulfilled and the chapter returned to good standing with the Order of Omega Headquarters prior to submitting a master’s fellowship or doctoral fellowship application. Doctoral Fellowship Applicants must be currently employed and enrolled at a college/university OR PREVIOUSLY employed at a college/university with an Order of Omega chapter in good standing with the Order of Omega Headquarters.